IMPORTANT INFORMATION below for operating a remotely piloted aircraft within 4km of Kapiti Coast Airport. Please ensure you have read and fully understand the conditions outlined below BEFORE requesting approval from the Airport Authority. An approval cannot be granted unless you meet ALL necessary requirements. In 2015, the Civil Aviation Authority (CAA) introduced new rules that apply to Remotely Piloted Aircraft Systems (RPAS) or otherwise known as "UAVs" or “drones". The intention of the Rule is to ensure the safety and privacy of the public are protected due to the rapid rise in the use of remotely piloted aircraft. Specifically, this requires any operation of remotely piloted aircraft within 4km of any airport to have approval from the airport authority first, which is subject to CAA requirements below, to ensure any use of RPAS within the vicinity of the airport will not compromise the safety and security of aircraft operations. It is also a criminal offence to endanger an aircraft in flight. Current requirements are that any RPAS flight shall comply with Civil Aviation Rule Part 101. This needs to specifically include Rule Part 101.205 – Aerodromes, in particular reference (A)(3). is the holder of a pilot licence or certificate issued under Part 61 or Part 149.
on or over any active runway strip area. Paragraph (A)(3) does not apply to a free flight model aircraft. Shielded operation means “an operation of an aircraft within 100m of, and below the top of, a natural or man-made object” – i.e. below the top of surrounding trees or buildings. Kapiti Coast Airport is NOT a “controlled aerodrome” and therefore does not have “controlled airspace” around it, however it does have an Aerodrome Flight Information Service (AFIS) whereby there is an operator in the Airport's tower providing advisory weather and airspace traffic information only to aircraft. Kapiti Coast Airport is technically an “uncontrolled aerodrome” in respect to the rules associated with remotely piloted aircraft. Civil Aviation Rule Part 101 outlines requirements for an RPAS pilot to ensure their operation remains within unaided visual sight (i.e. without the use of an instrument, such as binoculars or a telescope). First-person view systems are permitted under this rule, but still require a separate observer, who has suitable training and competency, and can maintain unaided visual line of sight contact at all times, with the aircraft and have direct communication with the pilot. This observer is, among other things, to advise the pilot of any other aircraft traffic that enters the operational area, the direction it is coming from, and advise on the appropriate actions to take to maintain safe clearances. 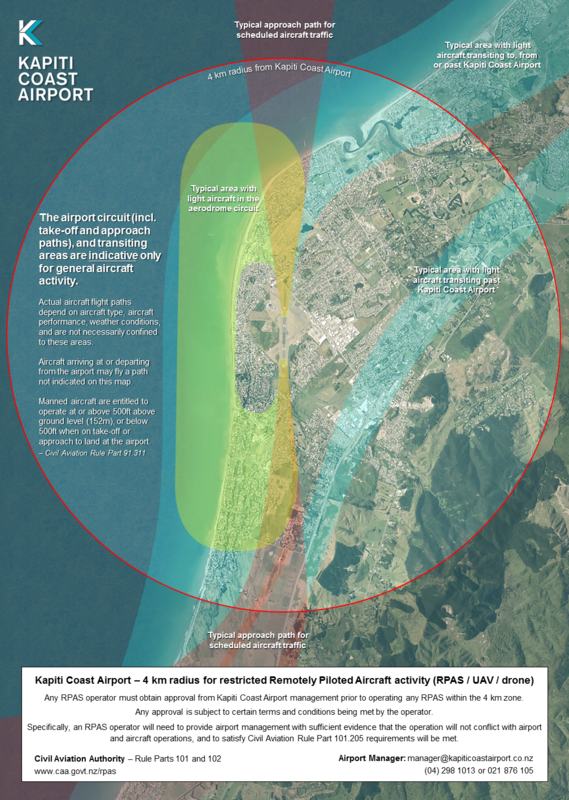 Essentially so long as it is no risk to Kapiti Coast Airport, and aircraft operations at or within the vicinity of the airport, we are generally OK with use of RPAS within the 4km radius of Kapiti Coast Airport providing we have an understanding and agreement of each RPAS operation. Each RPAS operation requires a separate approval from the Airport which is subject to the RPAS operator meeting requirements noted below due to liability and safety reasons. Please note the Kapiti Coast District Council is not able to provide approval in respect to this requirement. In order to ascertain the effect on airport operations and safety, and to provide any approval, we require an RPAS operator to fill out and submit an RPAS Approval Request available here. Any location for RPAS operations beneath or near the Airport’s approach and take-off flight paths and circuits requires extreme caution, as well as careful consideration with any approval given by the Airport Manager. For the flight operation, we need to issue a NOTAM for the duration of the operation to alert all pilots of the drone's presence. Generally to do this we would need an approval request at least the day before a proposed operation. It can be inconvenient for an RPAS operator to make contact for approval at short notice or at the time they plan to fly the aircraft, in order to determine all requirements are met, and have necessary safety mitigations in place, in which case it is likely that approval would not be given. The Airport Manager will provide a copy of the NOTAM once able to approve the flight and issue this. Once approval is issued, the RPAS operator will need to liaise with the airport tower (AFIS) accordingly to inform them prior to commencing the start of the operation and when completed, to confirm it will not be any concern to any aircraft, as well as be available on their mobile throughout the operation in case the AFIS needs to contact them. Contact details will be provided with an approval. When operating in relative proximity to the Airport's circuit and typical flight paths, we also require the RPAS operator's safety observer to have a VHF receiver tuned in to 118.30MHz. This is to assist both the pilot and their safety observer with maintaining a high situational awareness of other aircraft traffic and to receive any urgent warnings from the tower (AFIS) that would otherwise be delayed by use of a cellphone. If the RPAS operator does not have a safety observer, or is unable to source a VHF receiver, it is recommended that they get in touch with the Kapiti Aero Club – 04 902 6536 – who are quite willing to help out. If the operation is relatively far from the airport's circuit area, a VHF receiver is not required providing the pilot is in touch with the tower (AFIS) accordingly. If the RPAS operation is on or near runways and their approach and take-off fans (where it may infringe a runway’s Obstacle Limitation Surfaces), the operation may be subject to height restrictions or the runway may need to be closed for the flight to take place. Runway closures require coordination with all airport operators well in advance. If height restricted, we may require the RPAS aircraft to be no higher than a specified height above ground level at the advised location (including if shielded operation) due to the airport’s Obstacle Limitation Surfaces at this location. The CAA rule also requires the RPAS operator to seek approval from the land owner for the property they wish to operate over. If it is a park or public space they want to operate at, the Kapiti Coast Distrcit Council (KCDC) would need to provide permission. Subject to the altitude of the flight, the duration, location, controls in place including communication with the tower, and if the RPAS operator has provided sufficient information to satisfy Airport Management that all necessary requirements under CAR Part 101.205 are met, in particular references (A)(1),(A)(3) (i.e. copy of relevant certification/pilot qualification for the safety observer or the pilot), or (C) will not be of concern, we would generally be ok to provide approval to operate at an advised location that the RPAS operator may request. The aerial map below shows exactly how far reaching the 4km zone is. This map is only indicative of the typical flight paths of the aerodrome circuit and does not include flight paths of helicopters (that come in from any angle), and itinerant traffic that are transiting past the airport (generally along SH1 or along the coast). Our high concern areas are the take-off and approach paths (particularly where it may infringe a runway’s Obstacle Limitation Surfaces) and the general aircraft circuit. Kapiti Coast Airport recommends RPAS operators visit the CAA and Airshare websites to keep up to date with the progression of RPAS rules by the CAA. Completing an airshare.co.nz flight plan DOES NOT provide an approval from an Airport Authority.